On the Mat: 29 minutes. Observations: Let me be Honest. I’m trying to find what Feels Good and yesterday after choosing a dear friends call over my morning practice and then planning on coming home at 9pm to do Candle Lit Core:) The reality became... I was tired and just wanted a glass of wine with some little evening Hulu. But, Core happened this morning and that’s ok. This Journey is My Journey and I’m calling the shots:) And I showed up rested and ready. So, glad I did! Holy Buckets! That was Throw up working the core city and I’m not kidding. But, I’ll Take Today: Catching up with Friends, Laundry and finding Joy hibernating in the warmth of my little studio. Observations: Tonight was hard. The hardest yet and I have a feeling it ain’t gonna get easier. But, I’m still gonna show up. The flow and movements are becoming familiar which feels good. Yes, I was tired tonight and prefer on a work day doing this practice in the morning instead. I did do a downward dog fully tonight without modification:) that alone was worth it. But, I’ll Take Today: Good sleep tonight. On the Mat: 22 minutes. Observations: OK I did Feel tonight (which will be last night when you read this). My muscles shaked and shaked. But, it was worth it. I felt like I wanted to see what a evening yoga would feel like and it was awesome. My strength is there and it feels so natural. I’m kind falling in love with this 30 day or 29😜 Journey. But, I’ll Take Today: slowing down. Being present in my daily routine of work and doing my yoga practice tonight. On the Mat: 35 minutes. Insights: Magic happens in the In-Between. Love being reminded of that today and that Laughter is lovely. Adriene has such charming soul. On the Mat: 50 minutes. Observations: I showed up. My back ached, but I still felt strong. Yes, I will find my groove. Adriene is funny, kind and perfectly quirky. I planked and my arms shaked. I really need to sweep my floor and do a little pedicure if I’m gonna be on the mat more. I breathed deep and it reminded me of how far I have come. Self-care is important. I didn’t have to use my pink pillow. Insights: Strength over time. Discerning my why’s. And that I really am doing this to Rest Easy and Sink deeper into who I am and Not fight to be something other then Cindy Today. Imperfect, but showing kindness to myself by showing up. Hi I’m Cynthia or Cindy if you’ve known me for along time. I’m a curious soul and like trying new things. 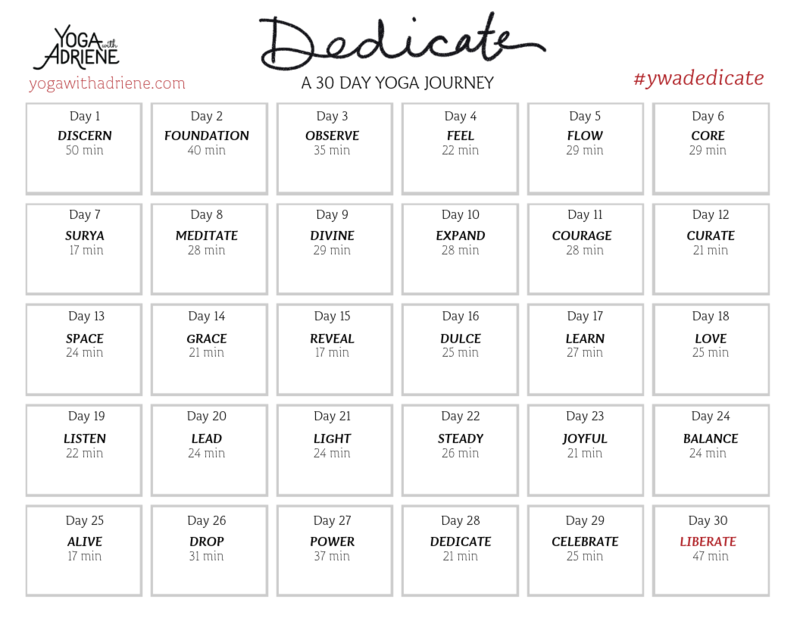 So, I’ve decided to go on this 30 day Yoga Journey with many other cool souls out there:) And being a storyteller, I’m gonna try to tell the story as well as I can. Keeping it simple. Calendar. A free download from Dedicate. I’ve decided to post it each day and cross off my progress with A Design Kit. I hope this break down helps and you might choose to come along with me.